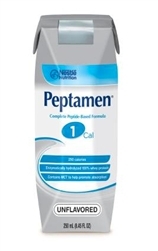 Peptamen® 1. CAL complete elemental nutrition is a peptide-based formula designed to be well tolerated when digestion is a challenge. Specifically for those who cannot digest or absorb nutrients from conventional foods. Six 250 mL serving provide 100% of the RDI for 22 key vitamins and minerals. 16% of calories are from high quality whey-based peptides to help promote absorption to help provide the body with the nutrients it needs. Comes in unflavored 250 mL cartons that can be used for tube feeding or as an oral supplement. The balanced peptide profile promotes GI absorption and integrity. Contains enzymatically hydrolyzed 100% whey protein, which may facilitate gastric emptying. 70% of fat is from MCT to decrease the potential for fat malabsorption. Note: Peptamen® contains milk protein. Not appropriate for individuals with cow's milk protein allergies. Appropriate for lactose-intolerance*, gluten-free and low-residue. - Impared GI function (malabsorption, pancreatitis, short bowel syndrome, chronic diarrhea, Chron's disease/IBD, Cystic Fibrosis, delayed gastric emptying, Cerebral Palsy, malnutrition, malabsorption related to cancer treatment, and Celiac disease with malabsorption). This product is a medical food for use under medical supervision. It is not intended to diagnose, treat, cure or prevent disease. Vanilla Flavored Peptamen 1 is no longer available.